You’ve studied the new rules for buying a Mac. You’ve weighed whether to get a laptop or a desktop. And you’re finally ready to add that new Mac to your holiday shopping list. But before you head to the store, be it brick-and-mortar or online, do you really know about all the choices before you? To help you make the right decision, we’ve put together summaries of each type of Mac on the market today—both laptops and desktops. Our summaries will tell you when each Mac model was last updated, what changed, and how it performs. We’ve also included links to both our full reviews of each system as well as tools for helping you find the best price. In the October overhaul of its laptop lineup, Apple introduced changes to both the interior and exterior of its MacBooks that blur the line between these consumer-oriented laptops and the higher-end MacBook Pro models. Like the MacBook Pro, the MacBook now features an all-metal unibody enclosure with a large glass trackpad and an LED-backlit display. As part of the redesign, the MacBooks now feature a Mini DisplayPort connector, freeing up more space on the outside and inside of the laptop. The new MacBook design does not include any FireWire ports—only two USB 2.0 ports—so users with a lot of FireWire-based peripherals may want to consider another model. On the inside, Apple upped the graphics power of the MacBook by replacing the integrated Intel graphics processor with an Nvidia GeForce 9400M chipset. Configurations: The unibody MacBooks come in two configurations: a 2GHz Core 2 Duo model with a 160GB hard drive for $1,299 (Get Best Current Price) and a 2.4GHz Core 2 Duo model with a 250GB hard drive for $1,599 (Get Best Current Price). The 2.4GHz also comes with an illuminated keyboard. How they perform: The improvements to graphics in the latest MacBooks have bolstered the performance of these models, particularly in the area of games. The Nvidia GeForce 9400m graphics in the MacBooks still shares memory with the system RAM as did the Intel GMA X3100 graphics processor in earlier MacBooks. But the GeForce9400M has its own graphics processing unit and shares 256MB of fast DDR3 SDRAM with the main memory, as opposed to 144MB of DDR2 SDRAM in the previous system. The bottom line: These MacBooks perform markedly better than their predecessors. And as our recent MacBook benchmarks found, performance approaches that of a low-end MacBook Pro. What we think: The latest MacBooks are a big improvement over the previous models—as long as you can live without a FireWire port. While battery life wasn’t as strong as the previous model, the sleek new case design, major graphics improvements, power-sipping LED display, and Multi-Touch glass trackpad make the MacBook a very strong upgrade. Read our complete -review of the new MacBooks. Like the MacBook, the October upgrade to the MacBook Pro introduced a unibody design. As with the revamped MacBooks, Apple’s October MacBook Pro update introduced the unibody enclosure and glass trackpad to the 15-inch configurations of the professional laptops. Both 15-inch MacBook Pros feature glossy displays. On the inside, they now sport two graphic chipsets—an Nvidia GeForce 9400M embedded on the motherboard and a discrete Nvidia GeForce 9600M. There’s also a 17-inch MacBook Pro that retains the enclosure from the previous generation of laptops. The main changes to this model focus on its display (it now features a native resolution of 1,920-by-1,200 in either glossy or matte form), the amount of installed memory (4GB instead of 2GB), and the size of the hard drive (320GB, up from 250GB). For the 15-inch models, a 2.4GHz Core 2 Duo MacBook Pro with a 250GB hard drive costs $1,999 (Get Best Current Price), while the 2.53GHz system with its 320GB hard drive sells for $2,499 (Get Best Current Price). How they perform: Our MacBook Pro benchmarks found that the 2.53GHz MacBook Pro is the fastest standard configuration Mac portable ever tested by Macworld Lab. This high-end MacBook Pro topped the Speedmark score of the previous top-of-the-line configuration by 16 percent. That said, the performance gap between the consumer and professional Mac laptops has narrowed, as we noted above. After this latest round of laptop updates, the MacBook-vs.-MacBook Pro decision leans less toward performance and more toward features and expandability versus size and weight. What we think: The MacBook Pro’s new design and its features definitely come out on the plus side of the ledger, with some outstanding aesthetic and engineering improvements to recommend it—not the least of which is the significant attention paid to environmental issues—at exactly the same price as the previous model. However the mandatory glossy screen may be a deal killer for some people, and the reduced battery life from the previous model (according to our testing) is a discouraging development. Read our complete -review of the new MacBook Pros. Only modest changes marked the October update to the MacBook Air. 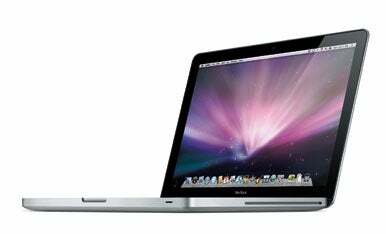 Introduced to much fanfare at the start of 2008, the MacBook Air underwent an autumn upgrade along with the rest of Apple’s laptop line. The changes to the Air aren’t quite as dramatic as the other MacBook models, which feature entirely new enclosures. (The only external change from the original MacBook Air is a Mini DisplayPort connector, replacing the Mini DVI port.) But the internal changes are significant. Like the other laptops, the Air switches to an Nvidia GeForce 9400M graphics chipset to ramp up performance. Apple upped the storage capacity of the MacBook Air’s hard disk drive by 40GB while doubling the capacity of the solid-state drive option. While the earlier MacBook Air featured a Parallel ATA drive, this updated version uses a Serial ATA model. Processor speeds are unchanged. Configurations: When the MacBook Air debuted in January, Apple offered just one standard configuration. With October’s refresh, the former build-to-order configuration is now an official offering, giving you two MacBook Airs from which to choose. The first is a 1.6GHz Core 2 Duo-powered machine with a 120GB Serial ATA hard drive for $1,799 (Get Best Current Price). The other model features a 1.86GHz Core 2 Duo chip and a 128GB solid-state hard drive; it costs $2,499 (Get Best Current Price). How they perform: As this article was posted, we’ve still only been able to get our hands on the 1.86GHz model for testing and review. Our 1.86GHz MacBook Air benchmarks found that many of the under-the-hood improvements in the updated portable have bolstered performance—especially when compared to the original MacBook Air and its Intel graphics—this is still a machine you buy for its small size and weight. It simply can’t match the speeds of either the MacBook or MacBook Pro. What we think: With increased storage space and improved performance, the latest MacBook Air is definitely an improvement upon the original release. And if you value the lightness of your laptop over its performance—and don’t mind paying up for ultra-portability—the Air remains a compelling buy. But with the changes to the MacBook line, there’s a faster, cheaper, almost equally attractive model available that weighs only 1.5 pounds more than the Air. Read our complete -review of the 1.86GHz MacBook Air. It’s easy to overlook the Mac mini. The small, display-free desktop machine has gone the longest of any Mac without an update—nearly a year-and-a-half since Apple quietly updated its low-end system by switching to the Core 2 Duo processor. The absence of an update fuels the occasional rumor that Apple’s about to discontinue the product. And yet, the mini is still here. A more pressing concern for would-be mini buyers is whether Apple plans to end the upgrade drought, perhaps coming out with new machines powered by more up-to-date processors. Still, shoppers looking for a basic desktop offering that won’t take a bite out of their wallets would do well to consider this compact option. Configurations: The Mac mini comes in two models—a 1.83GHz Core 2 Duo machine with an 80GB hard drive or a 2GHz Core 2 Duo system with a 120GB hard drive. That $799 2GHz Mac mini (Get Best Current Price) also comes with a slot-loading SuperDrive; the $599 1.83GHz model (Get Best Current Price) features a DVD-ROM/CD-RW Combo drive. Each mini ships with an Apple Remote and a power cord. You supply the mouse, keyboard, display, and any other peripheral. How they perform: The addition of Core 2 Duo processors helped the Mac mini post gains in the processor-intensive tests we ran in our August 2007 benchmarks. It’s worth noting that since that time, every other Mac that uses a Core 2 Duo processor—the iMac and all of Apple’s laptops—have switched to the next-generation version of the Core 2 Duo chip. Code-named Penryn, that version of the Core 2 Duo packs on more shared L2 cache and is more energy efficient. With the mini still powered by the earlier-generation Core 2 Duos, performance lags behind the Penryn-based systems. Still, with the Mac mini, it’s price, not performance, that usually drives the buying decision. What we think: Despite the long lag between updates, the Mac mini remains a great bargain, especially for those who already own a mouse, keyboard, and display. 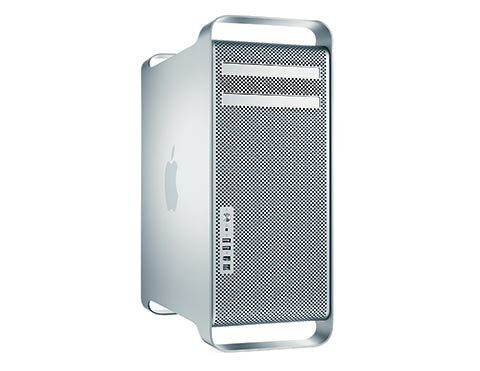 Its size and price allow it to fit into spaces and budgets that other Macs cannot. While the 2GHz model is the top performer of the two, if DVD burning isn’t something you need, the 1.83GHz Mac mini still gives a lot of bang for the buck. 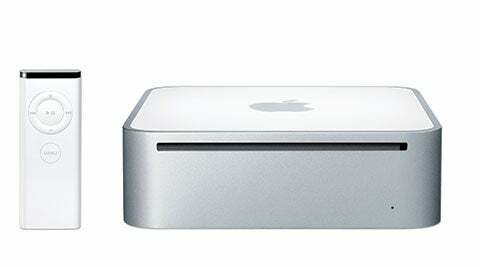 Read our complete -review of the Mac mini models. The latest generation of aluminum iMacs comes in two sizes—20- or 24-inches. The iMac saw an update at the end of April, with Apple upgrading the processors to the next-generation Penryn chips, increasing the amount of RAM that ships with two of the three configurations, and bumping the speed of the frontside bus to 1,066MHz. The company also gave 24-inch iMac shoppers the option of upgrading the standard ATI Radeon HD 2600 graphics processor to an Nvidia GeForce 8800GS with 512MB of memory. Additionally, users could opt to upgrade to a 3.06GHz processor—the first time a Mac aimed at consumers topped the 3GHz mark. The iMac had always been an ideal all-in-one system for consumers. With these changes, it’s an increasingly attractive option for professional users who don’t necessarily need the expandability of the Mac Pro. 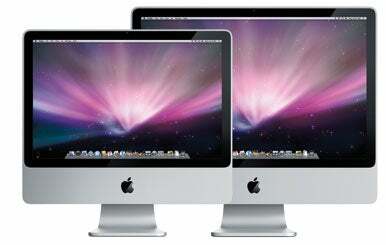 Configurations: Apple offers three iMac models—two systems with a 20-inch screen and a single 24-inch configuration. All three iMacs feature an 8X DVD-burning SuperDrive. The entry-level 20-inch iMac features a 2.4GHz Core 2 Duo processor, 250GB hard drive, 1GB of installed RAM, and ATI Radeon HD 2400 XT graphics. It costs $1,199 (Get Best Current Price). The other 20-inch iMac runs on a 2.66GHz process and ships with 2GB of RAM, and a 320GB hard drive. It features ATI Radeon HD 2600 Pro graphics and costs $1,499 (Get Best Current Price). The 24-inch iMac features the same hard drive, installed memory, and graphics as the 2.66GHz 20-inch model (with the option of upgrading to the Nvidia graphics card). 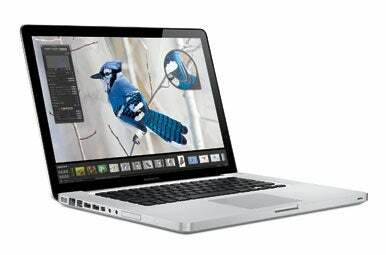 It sports a 2.8GHz Core 2 Duo processor and sells for $1,799 (Get Best Current Price). How they perform: Our iMac benchmarks found that the entry-level 2.4GHz iMac lagged slightly behind an older iMac with the same processor speed, though the latter’s larger hard drive and better graphics card skewed the results. When compared to a 2GHz iMac—the model it actually replaced—the new 2.4GHz machine fared much better. We also tested the build-to-order 3.06GHz iMac and found that its performance approached the speed of a standard Mac Pro configuration. What we think: The iMacs released by Apple this past spring are faster than previous models, but without any increase in price. On the downside, our one major complaint about the first-generation aluminum iMac—the poor viewing angle for the two -20-inch models—hasn’t been addressed. Still, the iMac offers enough features to appeal to both general consumers and professionals. And the -2.8GHz iMac is a stunning machine in all its 24-inch glory. Read our complete review of the iMac line. It’s been nearly a year since Apple updated the Mac Pro. The Mac mini isn’t the only Mac that has gone without an update for some time; it’s been nearly a year since the January 2008 release of an updated Mac Pro. That upgrade replaced the professional desktop’s two dual-core 2.66GHz Xeon chips with a pair of quad-core processors. Other changes include a bigger hard drive, more installed RAM (not to mention double the RAM capacity), and a new graphics card.